Busy photographers are always looking for ways to speed up the workflow and spend less time in front of a computer and more time behind a camera. Applications like Lightroom have improved the process tremendously, making cataloging and image adjustments easier and faster than before. If you have adjustments that you apply frequently, you can use presets to make it a single click process, applying a number of adjustments in one operation. Kevin Kubota has been providing presets and tools for both Photoshop and Lightroom users for quite a while now, and one of his products is a combination of a package of presets for Lightroom and a mini keyboard from RPG Keys that looks much like a numeric keypad on your keyboard. Available as a bundle for $349, or with just the presets as the Presets Workflow Collection for $49, you get over 100 presets that do everything from black & white conversions to skin tone enhancements (and a number of interesting edge effects). There is a bit of setup work to do in order to take advantage of the Speedkeys component of this package. You'll need to be sure to run the separate Speedkeys application before starting Lightroom, otherwise the keys won't be seen. The presets will still function as they normally would, but since you paid an extra $300 for the keys, you'll obviously want them available. 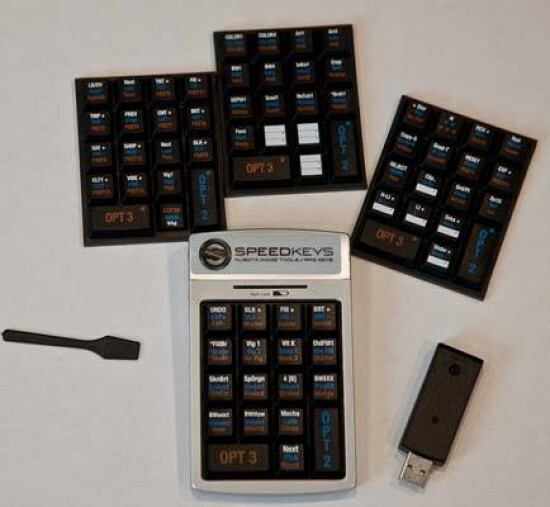 The Speedkeys require a USB 2.0 port for the dongle, but the keyboard itself is wireless and runs off of a pair of AAA batteries. Also included with Kubota RPG Speedkeys 2 are three more sets of keys that are labeled with presets and several blanks for using your own presets with the keys, and a “plucker” for popping the keys off to replace them. The keys have a number of common adjustments preassigned to them - Exposure, Blacks, Fill, Next, etc, and several of Kubota's develop presets. The adjustments can be applied in either the Library or Develop modules with different degrees of customization available to you. Personally, I find the default settings to be too large in the change they make. 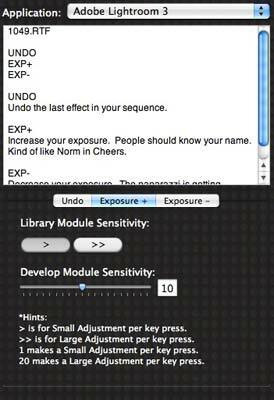 For example, exposure adjustments are made in full stop increments. By selecting the key in the Speedkeys application, you can change how strong of an adjustment is made, and you can customize what each key does, assigning it a completely different function if you like. Within the Speedkeys application, a description of each of the presets is available in the typical Kubota style - Kevin obviously enjoys his work. 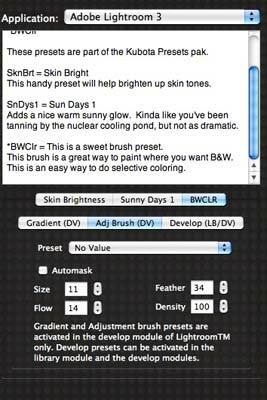 You also have the ability to set various parameters for the presets - the Gradient, Adjustment Brush, and Develop settings. Bot Gradient and Adjustment Brush can be used to fine tune how the preset is applied, and the Develop option allows you to select a different preset than the one that is currently applied.